Ten deputies have been placed on paid administrative leave after video showed a horse chase suspect being beaten while being taken into custody. APPLE VALLEY, Calif. -- Ten deputies have been placed on paid administrative leave after video showed a horse chase suspect being beaten while being taken into custody. "I am disturbed and troubled by what I see in the video," said San Bernardino County Sheriff John McMahon during a Friday press conference. "It does not appear to be in line with our policies and procedures." Deputies were attempting to serve a search warrant in connection with an identity theft investigation in the 25300 block of Zuni Road in an unincorporated area of Apple Valley when 30-year-old Francis Jared Pusok fled the location at 12:12 p.m. Thursday. McMahon said Pusok was not target of the search warrant. The chase went through Apple Valley and Hesperia until Pusok allegedly abandoned the vehicle near Bowen Ranch and fled on foot. He then allegedly stole a horse near Deep Creek Hot Springs. The horse threw Pusok in the area of Highway 173 and Arrowhead Lake Road at about 3 p.m. Deputies say they Tased him, but the Taser was ineffective. When they finally caught up to him, deputies were caught on video repeatedly kicking and punching -- even though the suspect was on the ground with his hands behind his back and legs spread. 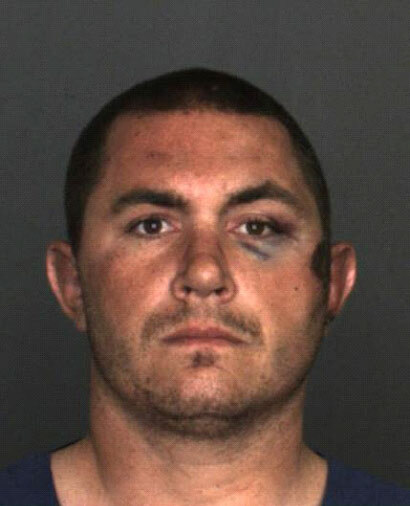 Francis Jared Pusok is seen in a mugshot from the San Bernardino County Sheriff's Department. Pusok suffered abrasions and bruises from the beating. He was treated at Arrowhead Regional Medical Center, and then booked at the West Valley Detention Center. "It is very difficult at times to control your emotions and clearly to control the adrenaline, not that that's an excuse for what occurred yesterday, but it is certainly a challenge that deputy sheriff's and law enforcement officers across the entire country face every single day," McMahon said. McMahon said Pusok was known to deputies from a previous incident. "A domestic call, where in fact he made threats to kill a deputy sheriff, and in fact shot a puppy in front of part of his family, and we were very familiar with his aggressive nature," he said. Along with the San Bernardino County Sheriff's Department's internal investigation, the FBI has launched its own investigation into whether Pusok's civil rights were violated. McMahon said the department won't release the names of deputies, including a sergeant and a detective, until they're sure that multiple threats made aren't valid. "I'm asking for some patience while we complete a thorough and fair investigation," McMahon said. "I assure you, if there is criminal doing on the part of any of our deputy sheriffs or any policy violations we will take action." Pusok will appear in court on Monday for an arraignment hearing. His attorneys say they intend to sue the county.